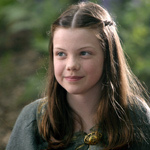 While The Lion the Witch and the Wardrobe balanced darkness with a sense of wonder, The Chronicles of Narnia: Prince Caspian moves further to the dark side. Based on the second book in C.S. Lewis’ Narnia series, the story tries to emphasize the importance of having faith and hope, even in the worst of times. But these themes often get lost in the grim world of the movie. Which takes us to London, one year after the children’s return from Narnia. Peter, Susan, Edmund and Lucy Pevensie (William Moseley, Anna Popplewell, Skandar Keynes and Georgie Henley) are having a hard time adjusting to their dreary old lives. Suddenly, the walls of the London Underground fall away and they find themselves on a beach. The excitement and wonder of passing into a different world is gone in this movie, replaced by confusion and loss. Their old castle is in ruins, and so is their kingdom. At this point, Prince Caspian becomes a war movie. Caspian will rally the Narnians. The Pevensies will join in the fight, with many tribulations to follow. Facing one’s fears and standing up to evil is at the heart of many children’s stories. This movie, however, didn’t draw me in as easily as its predecessor did. It wasn’t until more than halfway through, during a one-on-one sword fight, that I finally felt engaged in the movie. The filmmakers did a good job of shooting and staging the fight, without overediting it: not only was it exciting, but the action was easy to follow. The subsequent battle, between the Narnians and the Telmarines on an open field, was also fun to watch. The computer graphics were used more as a tool to create the sequence and less of a distraction. With so much emphasis on action, the characters have been mostly subsumed by the plot. The first movie was similarly plot-oriented, but had little touches to differentiate the children. Here, Peter, Susan and Edmund grimly fight the bad guys, while Lucy waits hopefully for the divine Aslan. The young actors do their best, but they’re not given much to work with. Prince Caspian is an equally blank slate, though Ben Barnes injects charisma into the role. Thank goodness, then, for Reepicheep and Trumpkin. Reepicheep, an oversized swashbuckling mouse (voiced by Eddie Izzard) might have been an annoying presence in other movies, but here he injects some much-needed levity into the unrelenting darkness. I suspect that Trumpkin (Peter Dinklage), the sarcastic dwarf, was a more pivotal character in the book. Here, Dinklage scowls his way through the movie, earning as many laughs as Reepicheep. Prince Caspian is easy to appreciate, but harder to enjoy. It’s a well-made movie with people at the helm who care about the book. There’s no rule that children’s fantasy stories must be all lightness and fluff. On the other hand, a sense of fun can turn a watchable movie into a very good movie. Prince Caspian tilts too far in the other direction. Hopefully, The Voyage of the Dawn Treader (scheduled for a 2010 release) will recapture the magic of the first movie.